One Of A Kind Unique Custom Themed Gift For Any Contractor, Handyman, Construction Worker or Builder! Shop brand new themed construction and contractor gifts at The Gift Planner. New one of a kind custom themed gifts that are unique. Business gifts themed to your industry! Let The Gift Planner help you select corporate gifts and promotional products. Many selections for any trade show or corporate event. Share your ideas of what you see as a custom gift. Allow us to create your idea and make it a reality! These useful and tasty gifts will represent you, your company and your industry! Our specialty one of a kind gifts that help you stand out. Unique and creative gifts not found anywhere else. Chocolate and cookies in this Bucket Bag Deluxe. 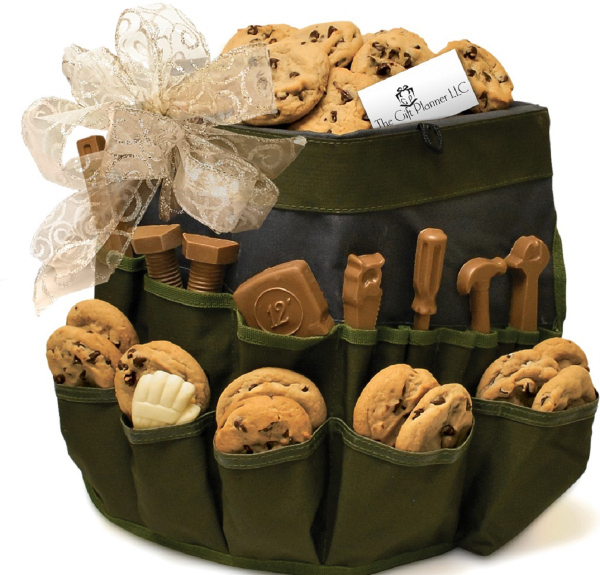 60 delectable cookies and a variety of 20 chocolate themed tools. Choose the tools to represent your company and industry. Perfect industry themed gift for construction workers and any contractor. A Handyman needs a thank you too. Construction company favorite as a thank you gift, or Christmas holiday gift. Large enough to share with the entire office staff. 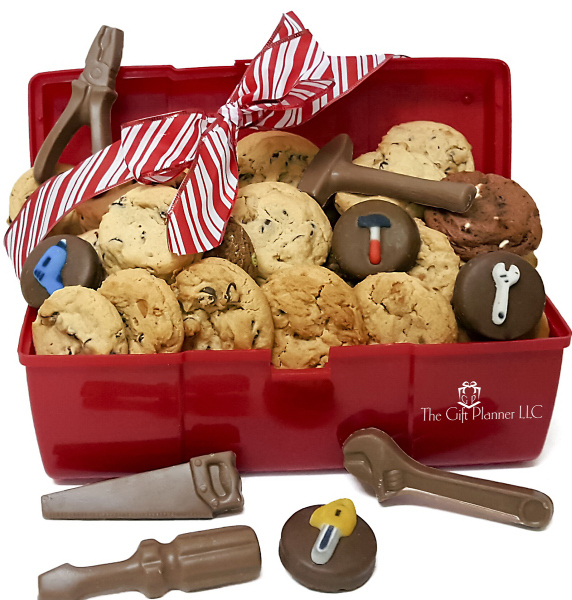 Corporate Construction Cookie And Chocolate Toolbox is a holiday favorite. Ships like a gift basket and is filled with chocolate tools and cookies. Assortment of 30 delicious chewy cookies. Double chocolate, chocolate chip, peanut butter, m and m, and more. 4 decadent chocolate covered Oreos with an assortment of construction themed sugar tools. 5 – 12 ounce milk chocolate construction tools. The red plastic toolbox is reusable. Measures 12 1/2″ X 5 1/2″ x 5″. This large folding tool set is a great corporate gift or giveaway. Perfect for hardware stores, handymen and contractors. 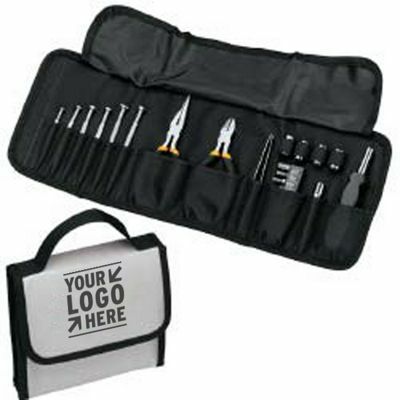 Wrench set features 25 individual tools and a sleek fold up nylon carrying case. This product measures 16 1/2″ x 6 1/4″ x 7/8″ when open. Includes pliers (long nose), 6 screwdrivers, 10 screwdriver bits with holder, screwdriver extender, screwdriver handle, 4 sockets (7mm, 8mm, 9mm, 10mm), tweezers, and wire cutters. This large folding tool set is a great gift or giveaway for hardware stores, handymen and contractors, this wrench set features 25 individual tools and a sleek fold up nylon carrying case for easy storage. This product measures 16 1/2″ x 6 1/4″ x 7/8″ when open and includes pliers (long nose), 6 screwdrivers, 10 screwdriver bits with holder, screwdriver extender, screwdriver handle, 4 sockets (7mm, 8mm, 9mm, 10mm), tweezers, and wire cutters.